I love seeing the look on my son’s face when he successfully sounds out a word. Even better when he can read an entire sentence. We visit our local library every two weeks to check out a slew of books, but I’ve had trouble finding ones that he can read. Even the Level 1 books are often too advanced for an early reader. Then I discovered Bob Books. Written by Lynn Kertell, each set of Bob Books contains 10 easy-to-read books with 3 new sight words introduced in each story. The stories include short sentences with repetition of 2, 3 and 4 letter words and simple illustrations to help with comprehension. The stories themselves are not life-changing. With titles like “Frog Sat” and “Sun Sets”, the books are a little light on plot, but they definitely held my son’s attention. And when your 4-year-old reads YOU a story. That’s priceless. There are a number of book sets to choose from including Beginning Readers, Word Families, Complex Words, Long Vowels, Kindergarten Sights Words and others. The books are numbered and build on each other so it’s worth reading them in order. Each box also comes with 30 double-sided sight word flashcards with a sentence on the other side for additional practice. 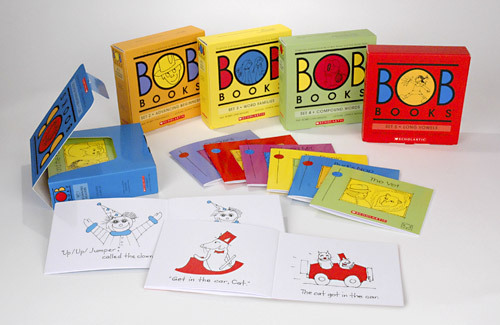 From time to time you can find the Bob Book sets on sale at Costco, otherwise they are available all the time at Amazon, Barnes & Noble, Toys R Us and other book and toy stores. There’s even a new Bob Books app! 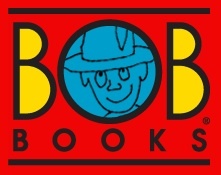 Visit www.bobbooks.com to learn more. Disclaimer: A sample of the product was submitted for review, but the opinions expressed are my own. I also wanted to send a huge shout out regarding the BOB books! My friend let me borrow her set when my daughters (7 and 5) were learning to read- and it has been such a blessing! This is the first book set I have seen that has made my 7 year old feel confident in her reading and simple enough for my 5 year old to read also. As a homeschool mom, I am always looking for things to help my girls read and the BOB books are a home run!! !